It's likely you'd heard of Vampire: The Masquerade—Bloodlines before last week's sequel announcement, even if you've never played it. 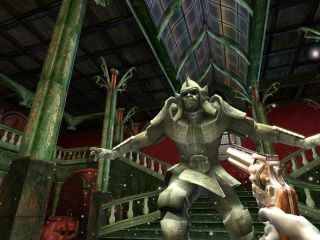 It's a cult hit with a vocal following, and often brought up in best-of lists—one of those beloved PC games cited as somewhat broken, but full of amazing ideas. If you missed out at any point between 2004 and now, GOG has it for $5/£3.79 right now in its Spring sale. I'll admit it, reader: Bloodlines is on my pile of shame, and I've owned the GOG version for about three years, installing it on various laptops and never quite setting aside the time to give it a try. That'll change in the next couple of (blessedly) quieter months. Chris's preview of Vampire: The Masquerade—Bloodlines 2 really got me in the mood for it, as did Jody's piece on the experience of being a vampire in the first game. Join me in experiencing it for the first time, if you wish. The bonus with the GOG edition is that it'll install with the basic version of Wesp5's Unofficial Patch (currently 10.2, though you can download version 10.3 here). The sequel, meanwhile, will be out in 2020.